The pink lidded cult classic that is Bioderma *insert rays of celestial light*. If you've watched a YouTube beauty video in the last twelve months then you are bound to have spotted a bottle of the product that has quickly made its way to holy grail status, that being the Bioderma Crealine H20 Cleansing Solution or Sensibio as it is sometimes known, designed for sensitive skin. So what exactly is Bioderma? Well, it's a micellar water that is scentless and designed to remove all traces of makeup from the skin. Basically it is a liquid, cleansing makeup remover that is very light and gentle on the skin. As this is a liquid you aren't left with the oiliness of a more gel based makeup remover and it feels refreshing on the skin. At the end of the day, armed with a pile of cotton pads and the bottle above my makeup comes right off hassle free. As this is the sensitive skin formula you can also use this on the eyes to remove any eye makeup with no hassle. It is the best thing I've used at removing all traces of mascara and the sometimes pesky shimmery eyeshadow. There is a little bit of a catch though. Bioderma is a bit of a mission to track down. You can buy it online here and here. I got my mini bottles through Amazon's site. This miscellar water is definitely worth the hype it gets. Whenever I make it back to Paris I'll definitely be tracking down City Pharma to lug a few bottles of this back home. 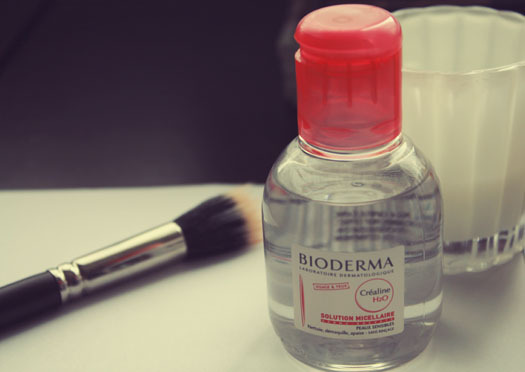 Bioderma, it's love.. I've yet to get my hot little hands on this! Can't wait to get some! Enabling me once again Miss S! I was actually planning on getting some today. So dying to try this!